For some reason, Civil War archaeology books have dried up in recent years. It's too bad. I very much enjoyed reading about the modern interdisciplinary approach and what it can teach us about the history and material culture of the period. Joan Cashin's upcoming War Matters: Material Culture in the Civil War Era (UNC, October 2018) isn't necessarily about items dug up out of the ground, but it does agree with archaeologists that "(m)aterial objects lie at the crux of understanding individual and social relationships in history." From the description: "The essays in this volume [from Lisa M. Brady, Peter S. Carmichael, Earl J. Hess, Robert Hicks, Victoria Ott, Jason Phillips, Timothy Silver, Yael Sternhell, Sarah Jones Weicksel, Mary Saracino Zboray, and Ronald J. Zboray] consider a wide range of material objects, including weapons, Revolutionary artifacts, landscapes, books, vaccine matter, human bodies, houses, clothing, and documents. Together, the contributors argue that an examination of the meaning of material objects can shed new light on the social, economic, and cultural history of the conflict. This book will fundamentally reshape our understanding of the war." This arrangement of inviting a group of scholars to discuss items and their meaning sort of reminds me of Gallman and Gallagher's Lens of War: Exploring Iconic Photographs of the Civil War. 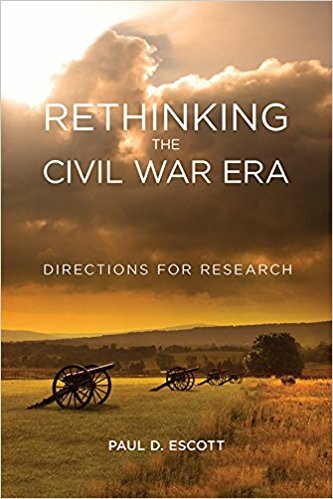 Paul Escott's Rethinking the Civil War Era seeks to insert a contemplative pause amid the publishing world's continuing stream of Civil War releases, offering one historian's view on where we are at and where we might (and should) go in the future. His book "surveys the current state of Civil War studies and explores the latest developments in research and interpretation." The volume is organized into big theme chapters (ex. causes of the war, war and society, military history, etc. ), and these focus on "specific issues where promising work is yet to be done, highlighting subjects such as the deep roots of the war, the role of African Americans, and environmental history, among others." The book "also identifies digital tools which have only recently become available and which allow researchers to take advantage of information in ways that were never before possible." I'm quite a ways into it, and it does appear primarily aimed at the graduate student audience, those seeking ideas for thesis and dissertation topics. More from the description: "Rethinking the Civil War Era is poised to guide young historians in much the way that James M. McPherson and William J. Cooper Jr.'s Writing the Civil War: The Quest to Understand did for a previous generation. Escott eloquently charts new ways forward for scholars, offering ideas, questions, and challenges. His work will not only illuminate emerging research but will also provide inspiration for future research in a field that continues to adapt and change." 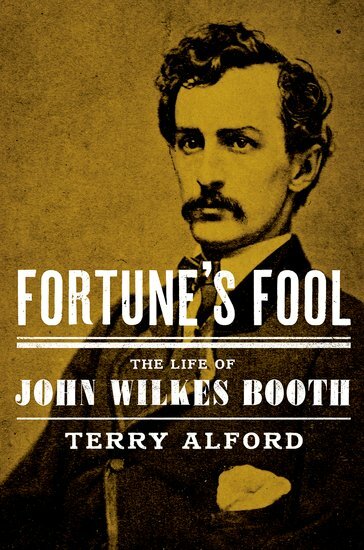 • Fortune's Fool: The Life of John Wilkes Booth by Terry Alford (Oxford UP, 2018). This is the 2018 paperback reissue of Terry Alford's Fortune's Fool, which was originally published by Oxford University Press in hardcover in 2015. Well received, the Booth biography was a multi-award winner and was also chosen Smithsonian magazine's "Best Book" of that year. Fortune's Fool "provides the first comprehensive look at the life of an enigmatic figure whose life has been overshadowed by his final, infamous act. Tracing Booth's story from his uncertain childhood in Maryland, characterized by a difficult relationship with his famous actor father, to his successful acting career on stages across the country, Alford offers a nuanced picture of Booth as a public figure, performer, and deeply troubled man. Despite the fame and success that attended Booth's career--he was billed at one point as "the youngest star in the world"--he found himself consumed by the Confederate cause and the desire to help the South win its independence." "Based on original research into government archives, historical libraries, and family records," the book "reveals the tormented path that led Booth to conclude, as the Confederacy collapsed in April 1865, that the only way to revive the South and punish the North for the war would be to murder Lincoln--whatever the cost to himself or others." I can't say that I'm familiar with the range of candidates for best Booth bio, but this one appears to be highly placed by those that are. 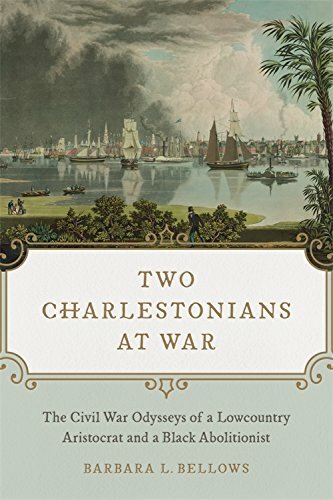 • Two Charlestonians at War: The Civil War Odysseys of a Lowcountry Aristocrat and a Black Abolitionist by Barbara L. Bellows (LSU Press, 2018). With the most worthwhile dual biographies, the sum is greater than the parts. Sometimes they work and sometimes the connections drawn between the two subjects are arbitrary or forced. The meaningfulness of the pairing Barbara Bellows sets up in Two Charlestonians at War is more creative than most. It "trac(es) the intersecting lives of a Confederate plantation owner and a free black Union soldier," ... "offer(ing) a poignant allegory of the fraught, interdependent relationship between wartime enemies in the Civil War South." From the description: "Recounted in alternating chapters, the lives of Charleston natives born a mile a part, Captain Thomas Pinckney and Sergeant Joseph Humphries Barquet, illuminate one another’s motives for joining the war as well as the experiences that shaped their worldviews. Pinckney, a rice planter and scion of one of America’s founding families, joined the Confederacy in hope of reclaiming an idealized agrarian past; and Barquet, a free man of color and brick mason, fought with the Union to claim his rights as an American citizen. Their circumstances set the two men on seemingly divergent paths that nonetheless crossed on the embattled coast of South Carolina." In early adulthood, the free-born Barquet left his native Charleston to settle in the North. At a Morgan-Freeman-in-Glory-ish 40 years of age, he enlisted in the 54th Massachusetts. "His varied challenges and struggles, including his later frustrated attempts to play a role in postwar Republican politics in Illinois, provide a panoramic view of the free black experience in nineteenth-century America." On the other side, Pinckney joined the Confederate Army, his wartime path eventually crossing with Barquet's while serving as an officer in the 4th South Carolina cavalry regiment. "After the war, Pinckney distanced himself from the racist violence of Reconstruction politics and focused on the daunting task of restoring his ruined plantations with newly freed laborers." "The two Charlestonians’ chance encounter on Morris Island, where in 1864 Sergeant Barquet stood guard over the captured Captain Pinckney, inspired Bellows’ compelling narrative. Her extensive research adds rich detail to our knowledge of the dynamics between whites and free blacks during this tumultuous era." When I reviewed James White's New Bern and the Civil War a short time ago, I mentioned how thin the published literature was on the topic, in particular coverage of the 1863-64 Confederate attempts to retake the coastal city, which at the time was one of the largest in the state and occupied by Union forces since the 1862 Burnside Expedition. Now it appears that another author, Hampton Newsome, is also throwing his hat into the ring. It's funny how often that happens. Last month he announced that his next book, "an in-depth study of Confederate efforts to seize Federal bases in eastern North Carolina during the first several months of 1864," is under contract with University Press of Kansas. For more information, go here. No release date estimate or title yet. Review of Hewitt & Schott, eds. 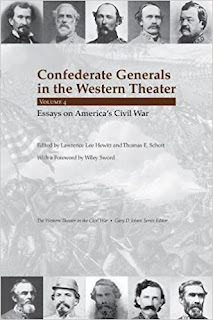 - "CONFEDERATE GENERALS IN THE WESTERN THEATER, Volume 4: Essays on America's Civil War"
Operating under the auspices of University of Tennessee Press since 2010, the Confederate Generals in the Western Theater series is the brainchild of historians Lawrence Lee Hewitt and the late Arthur Bergeron. After Bergeron's passing, Thomas Schott was brought on board to assist with a pair of related Trans-Missisippi volumes as well as this, the fourth and final installment of the western theater series*. Selecting for study a mixture of both familiar and lesser-known figures of varying degrees of command competence, the series volumes have consistently managed to have something interesting to say, even when addressing the careers of already well-documented general officers. 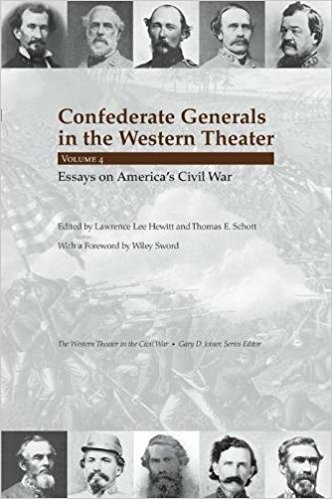 C. David Dalton begins the Confederate Generals in the Western Theater, Volume 4 proceedings with a fine overview of Felix Zollicoffer's role in establishing and defending the far right flank of Albert Sidney Johnston's extended western theater line of defense. In regard to criticism of Zollicoffer's occupation of both banks of the Cumberland River and his alleged disobeying of orders to recross the more vulnerable detachment, Dalton could find no evidence of the existence of a written copy of the order and reserves ultimate judgment on that count. He also well reminds readers that while Zollicoffer's name is most popularly and persistently attached to the Mill Springs defeat, the battle was really senior commander George Crittenden's to win or lose. Also, Dalton is persuasive in arguing that Zollicoffer's death had less to do with his famously impaired vision and more to do with the poor general visibility of the battlefield, with the combination of heavily misty atmospheric conditions and antiquated weaponry having more to do with the Confederate defeat than Zollicoffer's ill-timed demise. Robert E. Lee's plan for the defense of the South Atlantic seaboard, one that integrated rail mobility with prepared earthworks located just beyond the range of enemy naval guns, is well appreciated in the literature. The consensus among historians is that it was a highly efficient system that made the best of the region's limited military assets. Proof of its effectiveness lies in the fact that the system operated successfully for over three years without major modification by Lee's successors, succumbing only to overwhelming assault from the direction of the Confederacy's gutted interior very late in the war. Roger Durham's essay agrees with this assessment and offers a solid overview of the four-month period Lee spent in command of the Department of South Carolina, Georgia, and Florida. Stuart Sanders's chapter summarizes the life and Civil War career of Benjamin Hardin Helm, who was widely admired by officers and men alike. The essay has added significance when one takes into account the absence of a Helm biography in the literature. Due to limited sample size when it comes to the general's battlefield exploits (wounds and illness caused him to miss battles, and he was killed at the head of his brigade at Chickamauga), Sanders judiciously recognizes the difficulty in globally rating Helm's capabilities. The next three chapters are also broadly biographical in nature. Michael Bradley recounts the checkered life and military service of Bushrod Rust Johnson, arguing that the general's career pinnacle occurred during the months spanning the 1863 Tullahoma and Chickamauga campaigns. Brian Steel Wills does the same for Abraham Buford, noting that the burly, hard-drinking Kentuckian did well leading both infantry and cavalry, doing much to save Pemberton's army from complete rout at Champion Hill and developing into Nathan Bedford Forrest's chief and most trusted subordinate during the 1864-65 period. The late Nathaniel Cheairs Hughes's well-rounded treatment of Gideon Pillow takes the deepest dive of the three. The principal biographer of Pillow, Hughes is nevertheless not the only historian to assign to Gideon Pillow a great deal of credit for recruiting and organizing the Tennessee regiments that would later form the heart of the Army of Tennessee. As a discredited field commander, Pillow also demonstrated considerable energy and success heading the conscription bureau in the West. Perhaps the most interesting sections of Hughes's essay are those recounting Pillow's most obscure field service. As a cavalry division commander in 1864, the general twice demonstrated further ineptitude for high command. He led a poorly-coordinated June 24 attack on the federal garrison at LaFayette, Georgia (a little-known battle that is very well described in the essay, with the exception that Union Colonel John T. Croxton's name is given as Crofton) that ended up in a Confederate rout and also failed to do much of anything to oppose Rousseau's Raid in July of that year. James Prichard's article is a thorough account of John Hunt Morgan's final raid, an ill-advised operation that further tarnished the faded reputation of the "Thunderbolt of the Confederacy." The summation provides a good explanation of what the defeat meant to declining southern military fortunes in the West. The infamously disputatious William H.T. Walker is the subject of Stewart Bennett's essay. In it, Bennett traces the general's ill-fortune when facing enemy bullets (he was seriously wounded in three different major wars), his difficult personality and the effect it had on his career, and the possible consequences Walker's chronic poor health and many serious wounds had on both body and psyche. The chapter centers on the circumstances surrounding Walker's death on July 22, 1864, and Bennett makes a notable contribution to the Atlanta Campaign historiography by weighing all of the competing accounts, which differ widely in timing, location, and context. He makes a persuasive case that the most commonly cited interpretation (enduringly popularized by local avocational historian Wilbur Kurtz) is probably the one least likely to be true. The second to last chapter is Keith Bohannon's summary and assessment of Edward C. Walthall's Civil War career. A prewar lawyer with some military school education in his youth, the quick study Walthall clearly benefited from starting at the bottom, learning the military trade from company level all the way up through command of a division. As Bohannon's article demonstrates, Walthall's leadership was well recognized throughout the Army of Tennessee by late 1864. Even though there were many other more senior officers to choose from, Nathan Bedford Forrest explicitly asked for Walthall to lead the infantry contingent of the rear guard during the retreat following the army's disastrous defeat at Nashville. The essay makes a convincing case that Walthall was one of the most promising young officers in the Confederacy's western armies and likely would have made corps command if the conflict had been significantly extended. Chris Fonvielle's final essay effectively summarizes the three major late-war land and sea expeditions aimed at capturing Fort Fisher and closing the port of Wilmington, from the failed powder ship expedition to Ft. Fisher near the end of 1864 to the final evacuation of Wilmington in the face of an overwhelming Union assault in February 1865. The article centers on the impact of Braxton Bragg being brought in to oversee the department defenses. Fonvielle agrees with contemporary Bragg critics like W.H.C. Whiting and William Lamb that the unpopular general did little to support the defense of Fort Fisher and did nothing to inspire the Wilmington defenders. One struggles to come up with any great options Bragg might have had at that point, but the author's damning of the much-maligned general for apparently not even trying (or even appreciating the critical national importance of the Wilmington port and its defenses) is a point well taken. Volume 4 contains the same informative collection of diverse essays, several somewhat revisionist in nature, that characterize the series as a whole. The book's map set is impressive in number but usefulness frequently suffers due to nearly all of them being borrowed from other publications, the result being that the desired benefit of having the cartography directly tied to the text is largely absent. It's a relatively minor complaint with what is an excellent capstone to the Confederate Generals in the Western Theater series, which will be greatly missed. Well, it has now been nearly a full month since the last new release crossed my threshold (26 days to be precise! ), a very unwelcome record that has completely shattered the previous one. 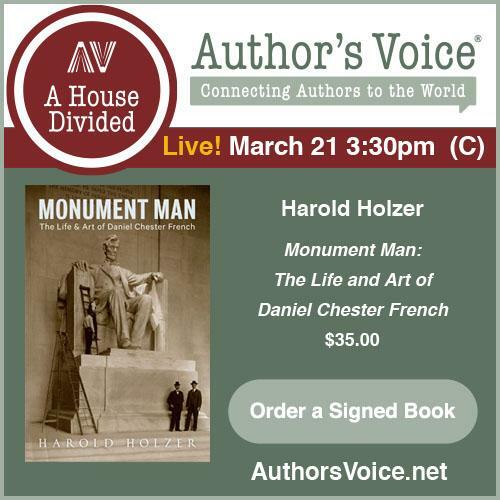 So, since there are still no March Booknotes to speak of we'll press on with Book News instead. My favorite non-book treatment of the Chickamauga campaign and battle is the long form (actually, very long form) article from William Glenn Robertson that was published in serial form by Blue & Gray magazine over five issues from Volumes 23-25. Robertson, of course, is a long-recognized expert on the subject, and many have wondered over the decades if he was ever going to shared it with the rest of the world in book form. The definitive answer to this question has finally arrived. October 2018 is the expected release window for Robertson's River of Death-The Chickamauga Campaign, Volume 1: The Fall of Chattanooga (UNC Press). I'm sure I'm not the only person that's still a bit Chickamauga'd out after reading David Powell's monumental trilogy, but I should be recovered by the time the leaves turn. I will be curious to discover where significant areas of disagreement exist between the Powell and Robertson interpretations, though I have doubts about my ability to recognize the most subtle ones. If you're reading this post and see ten books then come back tomorrow when you're more sober. Also, yes, I am fully aware that when it comes to this subject I could probably come up with a dozen of these lists and not repeat a title. That said, I think these five selections offer a pretty well-rounded introduction to the Irish-American experience in the ACW. 1. The Irish Brigade In The Civil War: The 69th New York and Other Irish Regiments of The Army Of The Potomac by Joseph G. Bilby (1998). Unless I'm missing the elephant (pink or otherwise) in the room, I don't recall a definitive-level Irish Brigade study towering head and shoulders above the rest. I do think Bilby's will serve the purpose of providing readers with a solid overview of the war's most famous ethnic brigade. Apparently, there was a 1998 hardcover special edition that sold out quickly, with the 2001 Da Capo paperback being the one generally available. 2. Shades of Green: Irish Regiments, American Soldiers, and Local Communities in the Civil War Era by Ryan W. Keating (2017). Keating's book impressively examines the war and home front community connections of three regionally representative Irish regiments. It also has important things to say about the unending alienation vs. assimilation debates. 3. The Irish General: Thomas Francis Meagher by Paul R. Wylie (2007). I wanted to include one biography here, and Meagher was arguably the most famous Irish-American Civil War soldier. The two most recently published full biographies were both authored by non-historians, but I'll put Wylie's on the list as the more scholarly of the two. by James B. Swan (2009). With the vast majority of published works devoted to the Irish regiments that fought with the Army of the Potomac, we shouldn't overlook the western theater's hard-fighting Irish units. Swan's book offers a fine study of one of these lesser-celebrated Union regiments. by David T. Gleeson (2013). Outside of Patrick Cleburne, the Confederacy's Irish soldiers are by far the least recognized of those that fought on either side during the war. Some unit studies exist (ex. James Gannon's history of the 6th Louisiana, Irish Rebels, Confederate Tigers), but I chose Gleeson's book for its broader discussion of the Irish-American experience in the South before, during, and after the Civil War. Those that appreciated Earl Hess's three-volume study of eastern theater field fortifications [Field Armies and Fortifications in the Civil War: The Eastern Campaigns, 1861-1864 (2005), Trench Warfare under Grant and Lee: Field Fortifications in the Overland Campaign (2007), and In the Trenches at Petersburg: Field Fortifications and Confederate Defeat (2009)] will be delighted to find that he and publisher UNC Press are taking the same general theme out west to the 1864 Atlanta Campaign, where Hess has devoted a great deal of his work of late. "As William T. Sherman's Union troops began their campaign for Atlanta in the spring of 1864, they encountered Confederate forces employing field fortifications located to take advantage of rugged terrain. While the Confederates consistently acted on the defensive, digging eighteen lines of earthworks from May to September, the Federals used fieldworks both defensively and offensively. With 160,000 troops engaged on both sides and hundreds of miles of trenches dug, fortifications became a defining factor in the Atlanta campaign battles. These engagements took place on topography ranging from Appalachian foothills to the clay fields of Georgia's piedmont." Fighting for Atlanta: Tactics, Terrain, and Trenches in the Civil War (October 2018) "examines how commanders adapted their operations to the physical environment, how the environment in turn affected their movements, and how Civil War armies altered the terrain through the science of field fortification. He also illuminates the impact of fighting and living in ditches for four months on the everyday lives of both Union and Confederate soldiers. The Atlanta campaign represents one of the best examples of a prolonged Union invasion deep into southern territory, and, as Hess reveals, it marked another important transition in the conduct of war from open field battles to fighting from improvised field fortifications." This is one more thing to look forward to in the fall. Review of Thomas - "WADE HAMPTON'S IRON SCOUTS: Confederate Special Forces"
The lop-sided nature of the Confederate victory at Fredericksburg overshadowed the fact that the Army of the Potomac had dangerously stolen a march on its opposite number during the early stages of the campaign, and Robert E. Lee joined his cavalry chief J.E.B. Stuart in vowing that an intelligence failure of that magnitude would not be repeated. The debilitating disease that swept through the Army of Northern Virginia's horses that November would not be used as an acceptable one-time excuse for the oversight, and the generals worked together to create a new elite scouting force that would operate behind enemy lines on a permanent basis. These scouts would be largely drawn from Wade Hampton's first command and would be known by various unofficial names, with their frustrated Union enemies going so far as to call them the "iron scouts." Unfortunately for the readers and scholars of today, documentary evidence of both the unit's creation and its many operations is fragmentary. 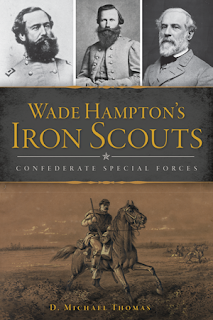 However, author D. Michael Thomas has assembled more than enough information to coherently form the first full history of the scouts in his book Wade Hampton's Iron Scouts: Confederate Special Forces. Getting men permanently detached from their regiments for special duty was always difficult, but Hampton's group of picked men was also intentionally small. There were rarely more than twenty men in the field at any one time, with particular missions employing anywhere from a pair of scouts to around a dozen men. Operating on a rotational basis and taking advantage of pre-screened local civilian networks for shelter and food, the scouts had an influence and effectiveness that far exceeded their tiny size. According to the author, their "primary mission was to gather and report information on the enemy, particularly regarding troop dispositions, concentrations, sudden changes, or movements." (Pg. 24). They would also be charged with selecting the best targets for raids and were generally engaged in all elements of irregular outpost war (i.e. capturing pickets, shadowing enemy movements, ambushing small detachments, and more of the like). Examples of their performances of all these tasks are vividly documented in the text. The Hampton scouts were not entirely unique (some readers will undoubtedly wonder why South Carolinians—the bulk of those recruited—were specially detailed behind enemy lines in Virginia! ), and Fitz Lee formed a similar unit, but available records and documents related to Lee's scouts are apparently even more sparse. As numerous instances described in the text show, between the beginning of 1863 and the end of the war the scouts were instrumental in the early detection of major Union movements in north and central Virginia. Accurate intelligence regarding the size and direction of these advances were critically important to Robert E. Lee's reactions, and the scouts came through with flying colors on multiple occasions, along the way earning from Lee frequent praised mention in official reports and correspondence. The job was certainly dangerous in the extreme, and as time went on and enemy awareness of their existence expanded more and more scouts would be killed or captured. When the war shifted from central Virginia to below the James River, the scouts further demonstrated their remarkable adaptability, almost instantly adjusting to the region's different military topography and unfamiliar civilian population. Their behind the lines operations did not skip a beat. Some of the scouts also went to North Carolina in 1865, providing the same valuable intelligence gathering and petite guerre services against Sherman's rapidly approaching Union host. Where possible, the author also provides information about which individual scouts were involved in each operation described in the book. He profiles the two most prominent scout leaders, William Mickler (the first man assigned to head the unit) and George Shadburne, arguing strongly that the latter's leadership role in the famous Beefsteak Raid (perhaps the scouts' most celebrated exploit) meant that his career as a whole would unfairly overshadow Mickler's. Thomas also effectively dispels the assertion (apparently commonly found in the writings of others) that the scouts frequently donned Union uniforms in the field. While frustrated Union commanders repeatedly threatened the scouts with execution as guerrillas, captured scouts were rarely mistreated and the author found no evidence that a scout was ever captured wearing an enemy uniform. Seventy-two soldiers served in the ranks of Hampton's scouts over the 2+ years of their existence, and Thomas's study also contains an impressive biographical roster of these men. Pieced together from "Compiled Service Records, family histories, newspaper accounts, obituaries, census records, findagrave.com, postwar books and magazine articles," the book's `Annotated Roster of Hampton's Scouts´ generally exhibits a good-sized paragraph or more of information for each man and should be an invaluable reference tool for future use. Applying very modern terms like "special forces" to fighting men of more distant history like the scouts is often frowned upon with good reason, but Thomas's descriptions of the organization, range of missions, and tactics employed by Hampton's men do seem to invite favorable comparison. In researching and writing Wade Hampton's Iron Scouts, D. Michael Thomas has done a commendable job of compiling and interpreting all the fragments of information available about the scouts and their wartime exploits, filling in many gaps and assembling the whole into a useful narrative. In this study the Hampton scouts have their first full history and first truly comprehensive appreciation of their outsized accomplishments. Jason Phillips's Looming Civil War: Imagining the Future in Nineteenth-Century America (Oxford, Oct 2018) has some thought-provoking elements. "How did Americans imagine the Civil War before it happened? The most anticipated event of the nineteenth century appeared in novels, prophecies, dreams, diaries, speeches, and newspapers decades before the first shots at Fort Sumter." Most anticipated event of the nineteenth century? Hmm. More from the description: "People forecasted a frontier filibuster, an economic clash between free and slave labor, a race war, a revolution, a war for liberation, and Armageddon. Reading their premonitions reveals how several factors, including race, religion, age, gender, region, and class shaped what people thought about the future and how they imagined it. Some Americans pictured the future as an open, contested era that they progressed toward and molded with their thoughts and actions. Others saw the future as a closed, predetermined world that approached them and sealed their fate. When the war began, these opposing temporalities informed how Americans grasped and waged the conflict." That clarifies things a bit, though one still has to wonder just how pervasive the view of America's domestic future as primarily conflict-based truly was at the time. Every generation within every society has a subset of doomsayers communicating all manner of fears and expectations of the future. Certainly though, looking at what those were during the decades leading up to the Civil War sounds intriguing. "In this creative history, Jason Phillips explains how the expectations of a host of characters--generals, politicians, radicals, citizens, and slaves--affected how people understood the unfolding drama and acted when the future became present. He reconsiders the war's origins without looking at sources using hindsight, that is, without considering what caused the cataclysm and whether it was inevitable. As a result, Phillips dispels a popular myth that all Americans thought the Civil War would be short and glorious at the outset, a ninety-day affair full of fun and adventure. Much more than rational power games played by elites, the war was shaped by uncertainties and emotions and darkened horizons that changed over time." 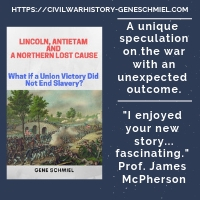 "Looming Civil War highlights how individuals approached an ominous future with feelings, thoughts, and perspectives different from our sensibilities and unconnected to our view of their world. Civil War Americans had their own prospects to ponder and forge as they discovered who they were and where life would lead them." Grierson's Raid was one of the most celebrated mounted operations of the Civil War, and it even served (loosely) as the basis for John Ford's very popular 1959 movie The Horse Soldiers, but serious book-length studies have lagged behind (in quality, if not in number) interest in the topic. The classic account remains Dee Brown's Grierson's Raid (1954), and there have been some other popular treatments of more recent vintage (ex. the Underwood and Lilicki books) that I haven't read, but the most promising development on this front is news that Timothy Smith's The Real Horse Soldiers: Benjamin Grierson’s Epic 1863 Civil War Raid Through Mississippi (2018) is on the publishing horizon. His The Decision Was Always My Own: Ulysses S. Grant and the Vicksburg Campaign (July 2018) will arrive first, but in terms of battles and operations history The Real Horse Soldiers will be Smith's first major return to the Vicksburg Campaign since his sterling debut Champion Hill: Decisive Battle for Vicksburg back in 2004. Vicksburg students will undoubtedly be delighted to learn that he's working on a book covering the May 19 and May 22 assaults, too. The Real Horse Soldiers also marks a homecoming with Savas Beatie after an extended sojourn among various academic presses (not surprising given Smith's career transition from park ranger to university professor). In producing consistently excellent work at a startlingly rapid pace, Smith is rivaling Earl Hess at this point. At the rate both historians are checking things off my personal wishlist, I for one couldn't be happier. 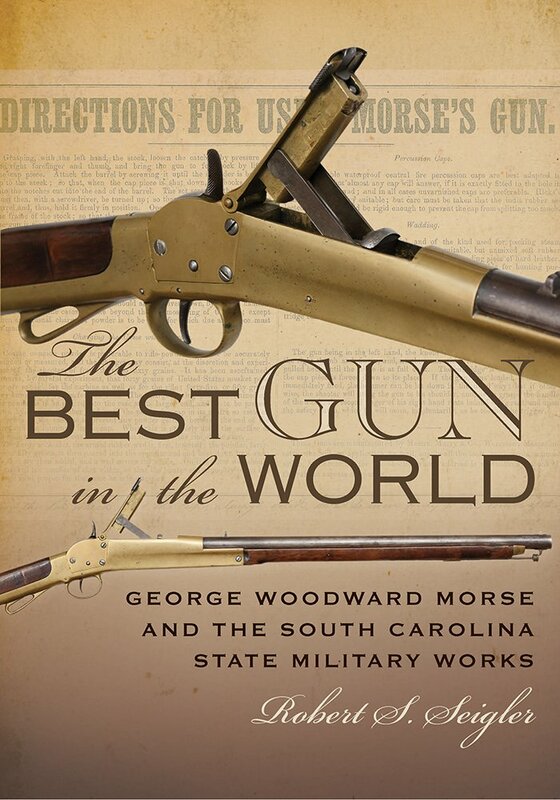 Review of Seigler - "THE BEST GUN IN THE WORLD: George Woodward Morse and the South Carolina State Military Works"
As title and subtitle suggest, Robert Seigler's The Best Gun in the World: George Woodward Morse and the South Carolina State Military Works is very much dual-focused. It is both a life study of New Hampshire-born firearms inventor George Morse and history of the facility that ultimately ended up producing his influential breach-loading carbine and fixed ammunition designs. After providing a brief account of Morse's early life, creative associations, and other antebellum activities, Seigler's book examines in great detail the late-1850s development of Morse's constantly evolving ideas and patents aimed at solving several centuries-old problems associated with breech-loading firearms. Morse's gun designs abandoned going down the road of further tightening/sealing of the breech mechanism and instead used the ammunition to do the job. Within a loose breech, his waterproof brass cartridge with a flared rear edge would expand and seal the gases inside the chamber. In addition to Morse's innovative sliding breech block (see cover art at upper left), the inventor's fixed ammunition cartridge possessed a novel pre-primed center fire ignition system that would be the forerunner of modern small arms ammunition. The book makes a strong case that this technological advance in ammunition was Morse's most significant contribution to firearms development worldwide. While test firings of an early Morse design impressed many observers (civilian and military), they didn't lead to a coveted U.S. Army production contract. When the Civil War broke out, the non-ideological Morse (he was northern-born but the source of his wealth was a large plantation in Louisiana) took his inventions south and offered them to the Confederacy. As outlined in the book, Morse's arguments in his own defense (among them the need to secure his southern properties and investments, which would be unprotected if he stayed loyal to the U.S. government) will likely ring hollow in the minds of most modern readers, and the fact that he produced arms for the Confederacy would do him no favors when trying to win his many postwar U.S. patent lawsuits. When the U.S. armory and arsenal at Harpers Ferry was abandoned after Virginia seceded, Morse attempted to secure some of the irreplaceable ordnance machinery there that survived Union demolition, and the book follows the path of precious tools and machines from Virginia to Tennessee, Georgia, and finally to South Carolina. Employed at several stops along the way, Morse was finally able to contract with the government of South Carolina to produce his brass-frame carbine design at the South Carolina State Military Works in upcountry Greenville. Between September 1863 and the end of the war, the State Works produced perhaps as many as 1040 Morse carbines (with the highest known serial number 1032). Although there were a few technical concerns (none insurmountable), the carbine was inexpensive, accurate, lightweight, didn't foul quickly, and could still fire after immersion in water, a good fit for an all-weather cavalry shoulder arm. Most were issued to mounted state troops, who apparently thought highly of them in the main, and Seigler's study exploits the scant information available regarding their use in the field to document which units received the arms and where they might have used them. Chronicling at length a number of lawsuits against private arms manufacturers and the U.S. government, the book also recounts Morse's many failed postwar attempts to obtain recognition and remuneration for his inventions. Morse achieved some small wins, but these were overshadowed by much greater defeats. The book advances the argument that Morse would have been much better served to patent both breech mechanism and cartridge together instead of separately, though it's not made clear precisely how and why. Whatever the truth about that, one certainly can't help but agree with Seigler that it was likely Morse's production of weapons used to shoot at U.S. soldiers during the war that figured most in the rejection of his federal patent lawsuits. As stated before, the book also serves as a comprehensive history of the South Carolina State Military Works. Former governor William H. Gist and noted Charleston carpenter-builder David Lopez are appropriately credited with the facility's development. Originally conceived as an artillery foundry, the resources needed to realize that lofty goal proved impossible to obtain. Instead, the State Works did a great deal of repair and conversion work while primarily producing machine tools, general military items, and Morse's carbine. The construction, management, production, and work force (white and black) histories of the State Works are all extensively recorded in the text. While appreciating the chronic underfunding, uncontrolled inflation, skilled labor shortages, and material scarcities that plagued southern manufacturing in general, Seigler also perceptively notes the drawbacks specific to the Greenville site. While comparative isolation certainly helped with security, it made finding and housing workers more difficult and increased transportation costs substantially. Employing much more expensive steam power versus hydro power also sent costs soaring, so much so that the state unsuccessfully tried to sell the always financially-challenged State Works in 1863. The Best Gun in the World succeeds in raising the profile of an important but neglected figure in world firearms history. Richly illustrated with photographs and meticulously rendered drawings of all kinds, the volume also thoroughly documents the features and technical details of Morse's many inventions and explains how they influenced later designs. Finally, the book is a significant contribution to the literature of southern wartime industry. March is shaping up to be another dismal month for new releases (nothing in the mail since February 21! ), but there are a bunch of intriguing summer and fall titles to look forward to or speculate about. I liked Allen Mesch's Teacher of Civil War Generals: Major General Charles Ferguson Smith, Soldier and West Point Commandant (2015), and now it appears that his interest in antebellum U.S. Army professional officer education is taking a broader approach with Preparing for Disunion: West Point Commandants and the Training of Civil War Leaders (August 2018), also from McFarland. Broader conversations regarding institutional evolution and change at West Point are commonly found in the Civil War literature, but I can't say I've put much thought into the ways a particular commandant might have applied his personal stamp to the system. According to Mesch's study, though the "impact on cadets and tactical education varied based on the amount of time as commandant and their attitude about the assignment," the influences could be striking. Among other things, commandants "made changes to the program" and "developed new textbooks." "The Army assigned sixteen officers as commandants between 1817 to 1864," and Mesch's biographical treatments of them "present an account of the commandant's contributions to the Academy, notable graduates, and other military service." Though I think I get what it's trying to say, perhaps a different title would have served Mesch's purposes better. On the face of it, "Preparing for Disunion" seems to suggest the preposterous notion that instructors had the eventuality of Civil War in mind or the author lends some credence to the conspiracy theories of the time regarding West Point training. Undoubtedly, neither interpretation represents the author's intentions. On this day in history (March 9, 1862), the USS Monitor clashed at Hampton Roads with the CSS Virginia. Both ironclads burned a lot of coal and angrily bashed in a bunch of each other's plates before going home, never to meet again. Offhand, I was trying to think of which one of the many books documenting this historic naval engagement stands head and shoulders above the rest, but came up empty. I'll have to think about that some more, so instead I decided to briefly highlight some books that document the sinking and rediscovery of the Monitor as well as the recovery and preservation of some of its major components. As we all know, the Confederates were forced to blow up the Virginia in May and the Monitor foundered off Cape Hatteras during a storm at the end of the year. Several twentieth century expeditions located the wreck of the Monitor. Among other things, their record of its deteriorating state prompted the creation of the Monitor National Marine Sanctuary. In the 1990s, the first serious attempts to recover artifacts for preservation occurred, with the propeller, engine parts, guns, and turret eventually raised between then and now. A number of books have explored this history and the ongoing process of conservation. A study of the recovery I particularly liked was John D. Broadwater's deeply informative and richly illustrated USS Monitor: A Historic Ship Completes Its Final Voyage (2012). Broadwater served as chief archaeologist of the NOAA’s Office of National Marine Sanctuaries, and he was manager of the Monitor National Marine Sanctuary from 1992-2005 (leading seven underwater expeditions to the wreck over that period), so he writes with considerable insight and authority on the topic. Most recently, I've been delving into "Our Little Monitor": The Greatest Invention of the Civil War by Anna Gibson Holloway (former curator of the USS Monitor Center at The Mariners’ Museum in Newport News) and Jonathan W. White. I'll have more to say about it in my review, which will appear later this month or in early April. The story of the recovery was in the national news for quite a while, and it's not surprising that it spawned a number of books. I can't comment specifically as I haven't read any of them but wanted to just mention a couple more. Part of the 1973 dive expedition, Robert E. Sheridan authored Iron from the Deep: The Discovery and Recovery of the USS Monitor (2003). Published in 2005, Paul R. Clancy's Ironclad: The Epic Battle, Calamitous Loss, and Historic Recovery of the USS Monitor explored once again the history, sinking, and subsequent salvage efforts, but it also promised "fresh insights into the sinking of the Union ship" and "the answer to an intriguing forensic mystery: the identities of the two sailors whose bones were found in the Monitor's recovered turret." Review of Tagg - "THE GENERALS OF SHILOH: Character in Leadership, April 6-7, 1862"
According to the description, the overall design of Larry Tagg's The Generals of Shiloh: Character in Leadership, April 6-7, 1862 is modeled after its now two decade old predecessor, The Generals of Gettysburg: The Leaders of America's Greatest Battle (1998), a staple item of many a Gettysburg home library. The format of The Generals of Shiloh is well suited to its purposes of emphasizing leaders, command relationships, and organization. With the closely paired general (or acting-general) officer background and Shiloh command performance discussions arranged for each leader in descending order of battle [army→corps (Confederate only)→division→brigade], the volume's presentation is also reminiscent of David Reed's pioneering The Battle of Shiloh and the Organizations Engaged (1902). By employing this non-narrative style, the volume perhaps more effectively conveys to readers the early-war structures of the three armies that met at Shiloh—the Confederate Army of the Mississippi and the Union's Army of the Tennessee and Army of the Ohio. With neither side employing true corps (three of the four Confederate proto-corps at Shiloh were in reality more akin in size to divisions), the military formation serving as the basic building block for discussion in the book is the division. As stated above, each division commander is given a brief biographical and basic leadership assessment section. This is immediately followed by another section providing both an overview of the general's command performance over the two days of battle at Shiloh and a broadly outlined discussion of the actions of his subordinate brigades. This process is then taken one step lower in the chain of command and repeated, with subsections for each brigade commander. Under those headings, brigade actions are summarized and the activities of each regiment and attached battery briefly recounted. Given how deep and well the operational and tactical aspects of the Shiloh campaign and battle have been documented in the literature already, Tagg appropriately limits his own unit by unit discussions to the salient points of their battlefield experiences. Most veteran Shiloh readers won't have much of a problem following the action, but the paucity of maps (the book has only one campaign map and one map of the battlefield) will likely leave many new and general interest readers confused amid the general swarm of units and places described in the text. The book also lacks an index, which is even more inexplicable. While attention paid to other parts of the book feels appropriate in scale, one wishes there was a bit more heft to the biography and leadership analysis sections assigned to the sub-commanders. In The Generals of Shiloh these are generally limited to less than a page and a half, which isn't much more text space than one might find in the leader introductions inside modern battle narratives. In emphasizing "character in leadership," it seems the book would have profited from expanding these parts a bit more. Because the still rapidly growing Union Army of the Tennessee at Pittsburg Landing was caught in the midst of reorganizing (and a number of leader were away from their commands), many lesser-known colonels found themselves acting-brigadiers. For some of these men and other officers (as well as those killed during the battle), Shiloh would be their shining moment before fading immediately or soon after into obscurity, and it would have been nice to get some deeper profiles of those individuals who made significant contributions but would never become household names—men like Union colonels John A. McDowell, Madison Miller, Everett Peabody, Abraham Hare, Julius Raith and Confederates Robert M. Russell, William H. Stevens, Preston Pond, and Walter S. Statham among others. Though less relevant, sometimes the abbreviated nature of the leader profiles also omits important parts of a general's later career. For instance, General Lovell Rousseau's later war service is described as having been "relegated to garrison duty by enemies in the War Department" (pg. 101), leaving out mention altogether of the successful and significant cavalry raid he led in July 1864 during the Atlanta Campaign, which was a high point of the otherwise largely dismal performance of Sherman's mounted arm. The Albert Sidney Johnston leadership portrait stands out as one of the strongest ones, with its judicious critical assessment of Johnston's martial abilities and the strengths and weaknesses of his command personality (particularly as they related to his management of P.G.T. Beauregard). The segment of the Army of the Mississippi history sketch covering Confederate strategic options in the West in early 1862 is similarly perceptive. The book also does a good job of shining a bright light upon the great preponderance of highly placed citizen-generals in the Shiloh armies. One might draw from Tagg's descriptions of the Army of the Tennessee's non-professional leadership corps that that army, through all its success from Shiloh onward, represented perhaps the highest pinnacle of the American citizen-soldier ideal and tradition. A case could be made that the greatest value of the book lies in its treatment of the Army of the Ohio and, by obvious extension, the discussion of the fighting on April 7. Outside of Timothy Smith's Shiloh: Conquer or Perish, the Shiloh literature continues to badly neglect the second day of battle in comparison to the first, and Tagg's book offers a good deal of information about the Army of the Ohio and the activities of all of its component units, both on the long journey to Pittsburg Landing and on the Shiloh battlefield itself. The volume eschews source notes, which is justified on the grounds that the volume is "not intended as a new definitive battle or campaign history" (see Introduction, pg. ix). Whatever one thinks of that line of reasoning, the decision leaves the reader to guess at where the author is getting his information. The "Critical Bibliography" helps in a general way, and some passages have very recognizable antecedents. For instance, the book's Army of the Ohio organizational summary is clearly very heavily influenced by Prokopowicz's All For The Regiment. However, the lack of notes becomes more problematic when potentially controversial statements are issued (for example, one doubts that James Garfield was ever truly a serious contender for replacing Rosecrans after Chickamauga). Some sections also cling strongly to older interpretations, leading to questions about how up to date the research is and how diligently Tagg sought out differing views. His presentation of Lew Wallace at Shiloh is regressively old school. Without any notes to guide the reader, it's unclear if Tagg is completely unaware of the respected revisionist scholarship of Gail Stephens, Charles Beemer, and others (none of their books are listed in the Critical Bibliography either) or is simply unconvinced by their arguments and those of other active Shiloh historians when it comes to reassessing Wallace. The author also clearly subscribes to the classic interpretation of Polk's capture of Columbus, Kentucky as one of the war's greatest unprovoked strategic blunders even though recent scholarship has somewhat mitigated that extreme position. 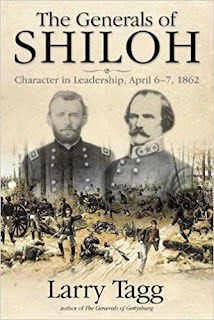 As one can readily grasp from what's written above, it is this reviewer's opinion that Larry Tagg's The Generals of Shiloh possesses considerable drawbacks and red flags, but it does have more than enough positive strengths to warrant a guarded recommendation. When it comes to being contrarian, William Marvel is one of our most compelling assets. I wish we had more like him. Even if you don't agree with his conclusions, he can always be relied upon to do the research and formulate respectable evidence-based arguments. Because it began life as an entirely different type of project altogether, Marvel's 2006 book Mr. Lincoln Goes to War had many intriguing and provocative parts but struggled to maintain a coherent whole. A particularly novel section involved Marvel's contention that troubling economic factors were at least as important as patriotism in inducing the masses of the North to enlist in the army following the Confederate firing on Fort Sumter and Lincoln's call to war. According to Marvel, the lingering effects of the Panic of 1857 combined with the commercial downturn, rising unemployment, and general economic uncertainty sparked by the secession crisis led a great many to see army service as their best hope for financially supporting themselves and their families. Now comes news that Marvel is fully fleshing out his case in a book wholly dedicated to the subject. Lincoln's Mercenaries: Economic Motivation among Union Soldiers during the Civil War (LSU, 2018) is scheduled for release in November. It "considers the question of whether the burden of military service in the Union army was borne mainly by the poor during the American Civil War. From a survey of the entire 1860 United States Census, renowned Civil War historian William Marvel constructs a clearer picture of economic conditions for the war's earliest recruits." More from the description: "Marvel finds disproportionate participation by men from chronically impoverished occupations, and documents the largely forgotten recession of 1860 and 1861. That fiscal downturn put hundreds of thousands of men out of work or blighted their businesses, leaving them susceptible to the modest emoluments of military pay and community support for soldiers’ families. Individual contemporary testimony, including direct or indirect personal admissions and personal observations, shows that the fervent recruiting of 1861 and 1862 was heavily driven not by patriotism, but rather economic distress, and confirms that the Union armies were composed mostly of poor men." "Notably, Marvel reveals that those who enlisted during those two years―generally regarded as the most patriotic of Lincoln’s soldiers―appear to have been motivated by money as least as much as those who enlisted in 1863 and 1864 for exorbitant bounties. A fascinating study of the intersection of war and economic conditions, Lincoln’s Mercenaries shows how economic pressures played a role during the Civil War and continued to play one even after the conclusion of the war when relative poverty among Union recruits helped fuel the demand for veterans’ pensions." Some people seem to get overly caught up in the wording of titles, and I hope the potentially vexing nature of this one doesn't serve as a major turn off to prospective readers. I certainly plan to put it on next season's review checklist. Though David Powell continues to author works related to Chickamauga-Chattanooga, I will be very interested in discovering what his research and writing interests will be going forward. Given that he's a VMI grad, it's not surprising that his next major study will be Union Command Failure in the Shenandoah: Major General Franz Sigel and the War in the Valley of Virginia, May 1864 (Savas Beatie, 2018). The Battle of New Market has been well documented over the years, with the most recent and best account being Charles Knight's Valley Thunder (2010). Powell's book posits that much of the focus remains on the Confederate victory (especially the famous contribution to it from the VMI cadets) and not enough attention has been paid to the larger picture and the Union side of things. According to the description: "VMI’s presence and dramatic role in the fighting ensured that New Market would never be forgotten, but pushed other aspects of this interesting and important campaign into the back seat of history. ... "Previous works have focused on the Confederate side of the battle, using Sigel’s incompetence as sufficient excuse to explain why the Federals were defeated. This methodology, however, neglects the other important factors that contributed to the ruin of Grant’s scheme in the Valley." Aimed toward addressing this deficiency, "Union Command Failure in the Shenandoah delves into all the issues, analyzing the campaign from an operational standpoint." As for what these other issues might be (or rather which ones Powell believes are most important), we'll have to wait and find out. (Univ of N Texas Pr, 2018). 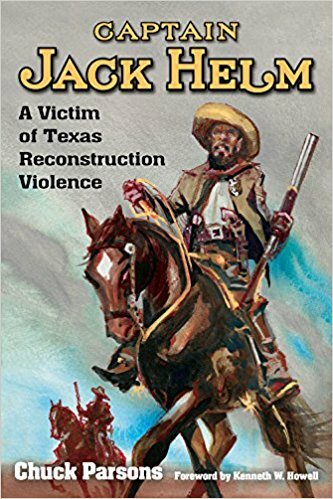 In his new book Captain Jack Helm: A Victim of Texas Reconstruction Violence, Texas history scholar Chuck Parsons "explores the life of John Jackson “Jack” Helm, whose main claim to fame has been that he was a victim of man-killer John Wesley Hardin. That he was, but he was much more in his violence-filled lifetime during Reconstruction Texas. First as a deputy sheriff, then county sheriff, and finally captain of the notorious Texas State Police, he developed a reputation as a violent and ruthless man-hunter. He arrested many suspected lawbreakers, but often his prisoner was killed before reaching a jail for “attempting to escape.” This horrific tendency ultimately brought about his downfall. Helm’s aggressive enforcement of his version of “law and order” resulted in a deadly confrontation with two of his enemies in the midst of the Sutton-Taylor Feud." The author has also written a full study of that last-mentioned violent dispute titled The Sutton-Taylor Feud: The Deadliest Blood Feud in Texas (2009). The book begins with a helpful literature review. Though the early life section is very brief and includes just a handful of pages describing Helm's Civil War service with the 9th Texas Cavalry (perhaps available sources are scarce on both accounts), the volume appears to be a full biography that concentrates on his violent law enforcement career in SE Texas. The appendix section contains some documents, an 1870 roster of Capt. Helm's Texas State Police command, and the text from a Goliad County historical marker. 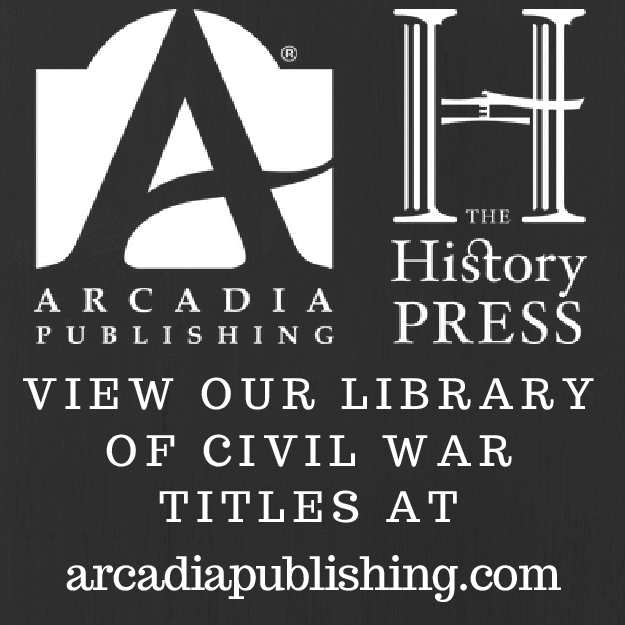 • Kirk's Civil War Raids Along the Blue Ridge by Michael C. Hardy (Arcadia Pub & The Hist Press, 2018). This is the last of the most recent batch of Civil War releases from Arcadia/THP. Born in East Tennessee, George W. Kirk opposed secession and actively resisted the Confederate government. He fought with the 2nd NC Mounted Infantry (Union) and later raised and led the 3rd NC Mounted Infantry. He's probably best known for his late-war raids into western North Carolina, but he and his men were a terror to the civilian population on both sides of the TN-NC border for much of the war. 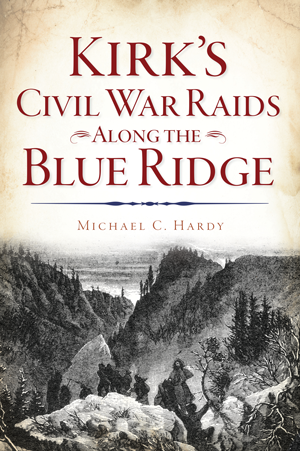 Michael Hardy's Kirk's Civil War Raids Along the Blue Ridge recounts the full story. From the description: "In the Southern Appalachian Mountains, no character was more loved or despised than Union officer George W. Kirk. He led a group of deserters on numerous raids between Tennessee and North Carolina in 1863. In 1864 at Camp Vance in Morganton, Kirk’s mounted raiders showcased guerrilla warfare penetrating deep within Confederate territory. As Home Guards struggled to keep Western North Carolina communities safe, Kirk’s men brought fear throughout the region for their ability to strike and create havoc without warning." Southern Unionism and the irregular war on the home front have been popular topics of late, and it looks like the book will be a great resource for those wishing to know more about Southern Appalachia's "inner war." Before Hardy's book came along, options beyond Matt Bumgarner's Kirk's Raiders (2000), which I haven't read, seem to have been pretty slim.